Bluebell Hill is 3 miles North of Maidstone and was opened in 1974. Being a main transmitter it is horizontally polarised. 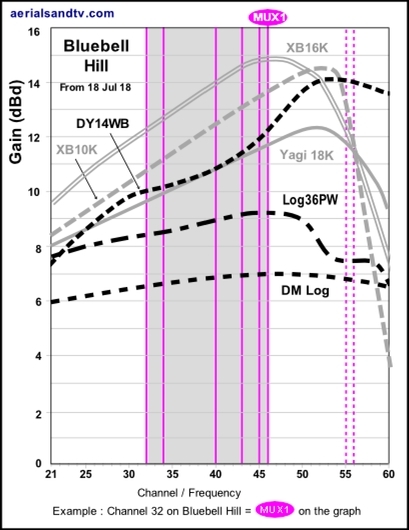 Originally (pre switchover) Bluebell Hill was an E group then became a B group (more or less) before becoming a K group after the 700MHz clearance in July 2018 (see Bluebell Hill`s Graph). 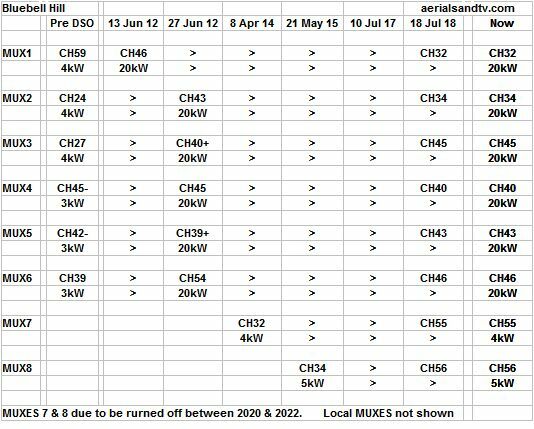 Note that most B group (or E group or wideband) aerials which worked before the switchover should continue to work fine. Ofcom quote Bluebell Hill`s maximum population coverage as being about 1.5 million, but that includes households which may well be on another transmitter with overlapping coverage, it`ll actually be significantly less than that. Also check Bluebell Hill`s three smaller repeaters. Also see other relevant B group curves. For Bluebell Hill`s frequencies see its channel allocation guide below. with the digital transmitting antennas is on the right. Question. Why is Bluebell Hill so called ? I couldn`t possibly guess, how about you ? Just like Sandy Heath ? Now then, not so fast young man. George Wise contacted us to say that Bluebell Hill isn`t Bluebell Hill at all, it`s actually Blue Bell Hill. Furthermore the moniker has nothing to do with flowers, it refers to a Blue Bell which used to summon the horses to draw the vehicles up the hill between Maidstone and Chatham. Consultation of a map of the area proves George to be right. However the transmitter is called Bluebell Hill by the BBC so I must (somewhat regretfully....) stick with the “incorrect” name. Incidentally the BBC has got a few of the other transmitter names wrong as well, though, as usual, I can`t actually remember which ones they are at the moment ! The nearest railway to Bluebell Hill is, very unusually, one which only opened in 2003, namely the Channel Tunnel Rail Link. In fact the line actually goes under Bluebell Hill in a tunnel which is only about half a mile to the SW of the transmitter. 700MHz clearance occurred at Bluebell Hill on the 18 Jul 2018 when it became a K group (CHs 32 to 46), excluding MUXES 7 & 8. Nearly all B group (or wideband) aerials will still work though. For Bluebell Hill we recommend the DM log for strong signal areas, the Log36 for medium signal areas, the Yagi18K for outdoor installs in poor signal areas, the XB10K for loft installations in poor signal areas, and the XB16K for those with the most marginal signals. Unless you have a massive loft we`d normally recommend an XB10B for loft installs (over an XB16) due to smaller size of the former aerial. The dimensions and test performance of the aerials can be found on the relevant tables. For Bluebell Hill`s frequencies see its channel allocation guide. This also includes the same data for some of the other major transmitters also receivable within Bluebell Hill`s coverage area, namely Crystal Palace, Sandy, Sudbury, Dover, Hastings, Heathfield, Tunbridge Wells, Whitehawk Hill (Brighton), Midhurst and Reigate. The Channel Allocation Guides can be very useful in the diagnosis of co-channel interference problems and can also be invaluable if you are trying to find a spare channel for a modulated output (e.g. for a Sky box or CCTV system) to be added to your TV setup/distribution system without suffering from co-channel. Those situated to the North or West of Bluebell Hill may find that during certain weather conditions they can suffer from co-channel interference as their aerials are pointing towards the continent. Note the large power increase after the 2012 digital switchover, and the fact that Bluebell Hill was an E group, then a B group, but is now a K group. 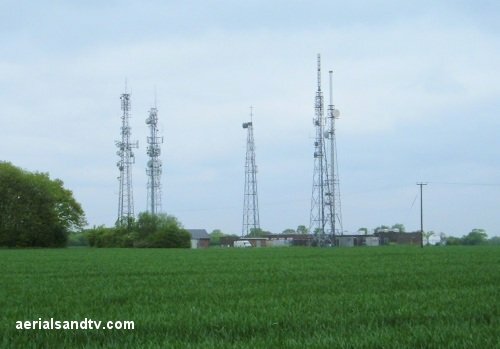 Bluebell Hill transmitter has (only) three smaller repeaters to improve coverage in poor reception areas within its coverage area. There is one ”Local” channel allocated to Bluebell Hill, CH27 (mainly) used for a Maidstone TV station.